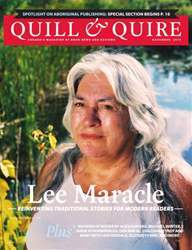 Featuring celebrated aboriginal author, poet, artist, and activist LEE MARCLE. Kelli Korducki on empowering future generations of editors to better serve aboriginal stories. Alexandra Shimo on co-authoring Edmund Metatawabin’s memoir, Up Ghost River. Plus, reviews of new fiction, non-fiction, graphica, and poetry. And Andrea Martin's editor shares his experiences working with the comedian on her first book, "Lady Parts". You'll receive 10 issues during a 1 year Quill & Quire magazine subscription. You'll receive 10 issues during a 1 year Quill & Quire magazine print subscription.